Caregiving is hard work. Few are prepared to take it on. The Good Caregiver is a survival guide with an insider’s perspective, for the millions of people who find themselves in a role they never trained for: caring for aging loved ones. •How does a nursing home differ from assisted living? •How is a homemaker different from a home health aide? •How far can you trust a hospital discharge planner? •What services does Medicare cover? •What are the potential legal and financial hurdles caregivers face? •Where does a caregiver turn for help? 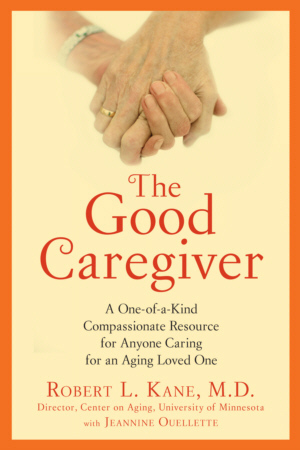 The Good Caregiver by Dr. Robert Kane provides a road map of clear and fearless answers. Dr. Kane offers his wealth of professional knowledge as a world-renowned aging expert, and also draws on his personal experience caring for his aging mother in her last years. Plentiful charts, lists, and tables make answers easy to find. And compelling stories from other caregivers offer comfort and much needed humor. Dr. Kane offers honest, straightforward, and heartfelt advice for those learning how to best care for their loved one and how to make thoughtful, informed decisions at each stage of the caring process.